The Orbitrack is a revolutionary, new, input device, which allows computer users to control both the direction and speed of the cursor with a single, soft touch. Requiring no hand or wrist movement the Orbitrack represents a significant advance in computer input technology and is suitable for all computer users, particularly young children and those with motor skill difficulties and movement impairment. 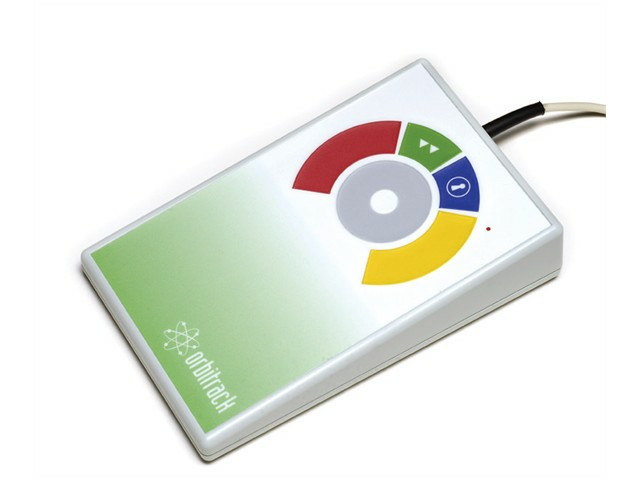 The Orbitrack uses a control ring to electronically manage cursor movement for precise targeting of objects on the computer screen. Unlike a mouse, trackball or joystick no hand or wirst movement is nesessary and unlike a touch pad the cursor does not have to be 'driven' around the screen by constant finger movement. Large, 50mm cursor control ring for easy operation and precise targeting. Soft touch operation (no pressure required). Ultra reliable with no mechanically moving/wearing parts. Sealed against the ingress of fluids. Ergonomic design - sloped case for comfortable wrist position and large palm/hand rest area. Symmetrical design allows use with either hand. Soft touch, colour coded buttons (left/right click, drag lock and double-click). Buttons easily accessed without the need for hand/wrist movement. Resettable memory provides an 'orientation' facility, switchable left and right click buttons, on/off audible alert signals and smart acceleration option. Auto detecting PS2 and USB protocols. Easy plug and play installation (no additional drivers required).